It’s travel time – and according to Airlines for America (A4A), the trade organization for the leading U.S. airlines, there will be 27.3 million passengers on U.S. airlines during the 12-day Thanksgiving travel period. Once again we contacted the airlines to request nutrition information for the foods they serve economy-class passengers on domestic flights and gathered data stored on websites and other online resources to bring you the 2016-7 Airline Food Survey. Virgin America is still doing a very good job of creating interesting, thoughtful food in all categories except for individual snacks. In fact, all the airlines could do better with their snack choices – there is no clear leader in this category. Following Virgin America, second place is tied between Delta and Air Canada, whose foods are healthier than those of other airlines. All the airlines have interesting food concepts going on. That said, Delta wins most improved from last year, and has the ability to take the lead if the airline makes a few easy changes. The “Shame on You” award goes to Spirit and Frontier airlines once again. Frontier in particular basically said they aren’t able to “pillage” through catering carts while a plane is on the ground to get good information. It’s shocking that their media department doesn’t have information on the food they serve. Also, one should note, it is not difficult to get nutritional information for foods Just more excuses from an airline that doesn’t serve healthy or quality food. Air Canada, Alaska Air and Allegiant responded quickly. But many of the airlines were slow in responding. This year. Hawaiian responded in timely fashion, but without anywhere near enough information. We had to have registered dietitians estimate the nutritional content of all the airline’s meals. The average number of calories per menu choice was 360 in 2012; in 2013 it was 388; in 2014 it was 397, 2015 it was 400 and this year it’s 392, an 8 calorie decrease over last year. Finally, I want to say that calories are not everything; we are looking at the nutrients in these foods when they are provided, as well as innovations moving towards healthy, tasty, inexpensive, sustainable foods. Comments: The airline continues to improve upon its food and it’s transparency. All food items served on board are listed on their website with all nutrient information, not just calories, exactly the way they should be. However we did find that a few number were off from what was sent, but they’re correcting. VA has such a commitment to food, I just don’t understand why at this point they don’t offer healthy individual snacks–nothing even close. How about an apple or an orange? I am impressed that the the average meal has dropped by 24.38 calories. But calories aren’t everything. Best Bets: Avoid the individual snack if you can. Even the nuts, which are the best choice, are high in calories if you consume the entire package. Always choose a real meal if you can, even if it’s slightly more calories it will keep you full longer. For breakfast try the Udi’s Granola with Yogurt and Fruit, which is a bit high in sugar but overall low in calories at 330. The best snack box is the Protein Meal with hummus, nuts and tuna; the others are a bit high in calories and are not really worth it. For kids, skip the Jet Set Kid Pack if you can, and go for the half peanut butter and jam sandwich (which unfortunately jumped 60 calories from last year). It’s still a better choice. In general, almost all the meals (as long as they’re eaten as meals and not snacks) are good choices. I was sorry to see the Salmon Ginger Salad go. However, the Ginger Chicken Soba Noodles at only 328 calories are a good choice and high in protein, which will help keep you full longer. If you like tuna, the Provencal Tuna Sandwich is a reasonably good choice with a nice amount of protein and low-fat mayo, The Protein Plate is also a good choice, as is the Vegan Wrap with veggies and humus – powerful from a health perspective. Again, these are meals that will fill you up and help you avoid the junk. The good news is that none of the food goes overboard in terms of calories, so you really can’t go too far wrong. Old Wisconsin beef salami, La Panzanella multi grain crackers, Oakfield Farms cheddar cheese, Pennysticks brand pretzels, the Good Bean sea salt chickpeas, and chewy Swedish Fish. Smokey shredded Kalua chicken on taro rolls with an island pineapple slaw. Sliced roast beef with sriracha mayo and fontina cheese served on a telera roll with baby spinach, fresh basil, tomatoes, cornichons and red onions. Comments: The airline has had a slight increase in overall calories from 512 to 527. The biggest jump is in the average meal calories which jumped from 546 to 628. The good news is that the individual calories are way down 320 to 153. It has eliminated many of its individual snacks. Delta continues its commitment to improving it’s food in terms of health and consciousness. Over the summer, the airline launched new menus called Flight Fuel, which replaced the EATS program. The new menus attempt to focus on “transparency into ingredient and allergen information for customers.” Along with the new Flight Fuel launch, Delta also upped their nutrition game this year by providing a key on the menu for snack items that are Non-GMO, Vegan, Gluten-Free, Kosher, and Lacto-Ovo Vegetarian. Also, the Tapas box is the U.S. airline industry’s only non-GMO snack box. Delta continues to work with Luvo (www.Luvoinc.com), which has a very strong commitment to healthy eating. All the calorie information for the Luvo items are listed on Delta’s menu (and online); but be aware that the calories listed apply only to the individual sandwich or wrap, not the entire meal — which can be confusing if you don’t see the asterisk. It would be nice to see other nutrient information, such as fats, proteins, carbohydrates and sugar, listed as well. Best Bets: For a snack, the nuts are the best choice–even over the lower-calorie pretzels. The vegan, GMO-free Tapas Snack Box is a good healthy choice if you share or make it a meal (it’s too high in calories as a snack). For within the box, the best bests are the Super Seed Crackers, Snapea Crisps, dark chocolate, almonds, hummus, and quinoa with pepper dip, you can pass on the rest. For morning travel choose the continental breakfast (fruit and yogurt). It’s 331 calories, but save the Kind bar for a snack later in the day. If you’re on a transcontinental flight, your best bet is the LUVO Fresh Breakfast Medley. For Lunch/Dinner on regular westbound flights, choose the LUVO Southwest Grilled Chicken Wrap (without the cookie), and on eastbound flights the LUVO Sesame Grilled Chicken Wrap is a good choice. Again, you can skip the cookie to save calories. For Lunch/Dinner on transcontinental flights, the LUVO Mediterranean Whole Grain Veggie Wrap is a good choice and will fill you up (without the cookie). Pass on the Mesquite-Smoked Turkey Combo and the Black Angus Burger. Total = 665 calories/ 144 minutes of walking. Total = 671 calories/ 145 minutes of walking. Total = 343 calories/ 74 minutes of walking. Chilled fruit served with Strawberry Greek yogurt and a Kind Bar. Total = 331 calories/71 minutes of walking. Total = 326 calories/70 minutes of walking. Total = 394 calories/85 minutes of walking. Mesquite-smoked turkey with Gruyère and Roma tomatoes, smeared with a creamy tomato-basil spread and topped with arugula on ciabatta. Complete with Wise Kettle Potato Chips and a Dancing Deer Brownie. Grilled chicken with whole grain rice, edamame, shiitake mushrooms, and barley. Mixed with arugula, romaine, and a toasted sesame ginger dressing inside a tomato whole grain tortilla with green garbanzo hummus. Served with a multi-seed coconut chocolate chip cookie. Cage-free hardboiled egg, baked apple-cinnamon pita with a side of apple-ricotta dip, sliced Granny Smith apple, spiced almonds, and an organic strawberry. Served with Luvo Organic Green Earl Grey tea. Chicken apple sausage, cage-free hardboiled eggs, sweet and spicy red peppers, mixed greens, and a sweet potato-mango hash wrapped in a chia seed whole grain tortilla with a side of red pepper hummus, fresh grapes and a strawberry. Served with Luvo Organic Green Earl Grey tea. Turkey bacon and cage-free hardboiled eggs with a southwest corn and black bean whole grain salad tossed in a cilantro yogurt dressing wrapped with mixed greens and Monterey Jack cheese in a chia seed whole grain tortilla with a side of red pepper hummus, fresh grapes and a strawberry. Served with Luvo Organic Green Earl Grey tea. A third-pound of Black Angus beef on a Vienna roll with mild cheddar, Roma tomatoes, and romaine, with ketchup, mustard, and mayonnaise on the side. Whole grain bulgur with green garbanzo beans, zucchini, roasted tomatoes, feta cheese and kale dressed in balsamic vinaigrette. Mixed with arugula and romaine in a spinach whole grain tortilla with green garbanzo hummus. Served with a multi-seed coconut chocolate chip cookie. Aged Spanish Manchego (mild, softly firm), Boerenkaas Aged Gouda from the Netherlands, and Grafton’s Vermont Cheddar (rich, creamy, slightly sharp). Served with olive oil flatbread crackers, fig spread, dried apricots, Marcona almonds, fresh Gala and Granny Smith apple wedges, grapes and a Harry & David dark mint chocolate. Includes soft and earthy Murray’s Brie (mild, buttery), brine-washed French Morbier (doughy, pungent), and Irish cheddar (sharp, crumbly). Served with rustic olive oil flatbread crackers, fig spread, dried apricots, marcona almonds, fresh Gala and Granny Smith apple wedges, grapes and a Harry & David dark mint chocolate. Comments: The staff has always been helpful in providing information, which is nice and shows that Air Canada cares about its food. It keeps calorie counts low for meals and snacks. Also it’s nice that they offer meals and no snack boxes. That’s the good news. Interestingly enough, the airline took a page from Delta’s playbook, and added a LUVO product — a good food move. There are several strong and low calorie meal option, which is great. The individual snacks definitely need some work because there are nearly no healthy choices. Best Bets: For breakfast, the Greek yogurt is still a good option– and will probably fill you up. And while the egg sandwich has bacon, it’s low in calories and has slightly more protein than the yogurt. The Chicken Soup is a low calorie choice for a snack that will fill you up, but be wary of the 950mg of sodium if you have high blood pressure. The Celery & Carrots with Ranch Dip (if you you use no more than half the dip) is still an OK choice. While the hummus and the new guacamole options sound healthy, the pretzels and Tostitos offer little nutritional value, and you’d be better off having a meal if meals are available. If meals are available, the newly added LUVO Orange Mango Chicken is a good low-calorie choice. The California Roll is another a light offering that’s low in fat and calories. It would also make a great snack! The Roasted Vegetable Sandwich is also a healthy, low calorie option. Egg, back bacon and cheddar cheese on an English muffin. Homestyle macaroni in a cheese sauce, served with a dinner roll. Orange mango chicken with green tea infused brown jasmine rice and kale. Montreal-style smoked meat with pickles and yellow mustard on rye bread. Roasted chicken strips with sriracha mayo, romaine lettuce, onions & fresh broccoli slaw on flatbread. Roasted red pepper and zucchini with grape tomatoes, black olives, arugula and Mediterranean hummus on green pesto panini. Total=260 calories, 4g fat, 48g carbohydrate, 6g protein, 560mg sodium / 56 minutes of walking. Comments: Last year they were not cooperative, but this year Alaska Airlines is back in the mix and seems to be excited to participate in f the survey. The overall average calories in their food offerings has fallen from 537 to 521. The calories in an average meal also went down significantly from 606 to 577 (however, two years ago they were in the high 400s). Calories overall are moving in the right direction , but calories are not the only variable to include when considering health. Best Bets: Alaska does not have individual snacks – a good thing. Among the snack boxes, the Mediterranean Tapas hasn’t changed much from last year and is still the healthiest choice. It has olives, hummus, almonds, dried fruit and even a dark chocolate bar. But keep in mind that 519 calories is a bit high for a “snack” (or even a meal), so it’s best if you either share the box or have it as a meal replacement. For kids, the snack box may be tempting, but it’s always better for children (and adults) to eat a real meal than it is to “snack” aimlessly. FYI, the beef jerky is low in calories but very high in sodium. As far as breakfast goes, you can pick the Breakfast Scramble; it’s high in calories but will keep you full longer. If you opt for the fruit and cheese plate, skip the crackers and half the cheese. There aren’t too many dinner choices, but the Miso Chicken will suffice as long as you consider it a meal. Total = 526 calories, 32g fat, 47g carbohydrate, 13g protein, 750mg sodium, 15g sugar/114 minutes of walking. Pirate’s Booty White Cheddar Puffs, Old Wisconsin Turkey Snack Stick, Tree Top Cinnamon Applesauce, My Super Snack Chocolate Chip Granola Bar, YumEarth organic fruit snacks, Wikki Stix Play Pack. Two wedges of Beecher’s Flagship cheese along with Tillamook Sharp Cheddar and Brie. Your cheese plate includes fresh fruit, Partners crackers and a Seattle Chocolates Truffle. Slices of chicken apple sausage are mixed with scrambled eggs, home-style potatoes, diced red pepper, and topped with parmesan cheese. Turkey and a seasonal hash of roasted sweet potato, onion, and kale. Highlighted with an herb butter and topped with seasoned bread crumbs. Pulled chicken tossed in a smoky barbecue sauce flavored with ancho chile and molasses. Served with a side of coleslaw. Sliced grilled chicken glazed in a sauce flavored with ginger, pineapple, and red miso. Highlighted by tangy sesame carrots atop a bed of ginger garlic fried brown rice. Serving size 10.3 oz. Chicken in a sweet and savory Hawaiian-inspired sauce, with scrambled eggs and steamed rice. Tender grilled chicken, stir-fried vegetables and steamed rice, with a savory teriyaki sauce. Best Bets: Still not too much in the way of healthy individual snacks. So keep in mind, the individual snacks are free. and the JetBlue team is generally friendly and will not say no to requests for extra portions. As for the meal boxes, we still like the Pump Up, which has healthy ingredients (Mary’s Gone Crackers-Original, olives, hummus and bean crisps), but remember that it’s a meal and should not be eaten as a snack ( skip the olives if you are sodium sensitive). Skip the other meal boxes, which are high in calories and fat and offer little in terms of nutrition. If you are on a flight that offers the Eat Up Café, the Yogurt and Granola (you might want to limit the honey), the Kale & Quinoa Salad and the Spicy Soba & Korean-Style Chicken (unless you’re sodium sensitive) are all good choices. Skip the Grilled Chicken and Brie Sandwich, which is very high in calories and low on nutrition. Mix’t Up Honey Roasted Cashew Crunch (120 calories), KIND Granola Bar Oats & Honey (150 calories), Gilman White Cheddar Cheese Stick (90 calories), Fruit Me Up! Applesauce (40 calories), YumEarth Naturals Fruit Snacks (70 calories). Total = 470 calories, 16g fat, 69g carbohydrate, 10g protein, 475mg sodium, 5g fiber/102 minutes of walking. Roasted Red Pepper Hummus (84 calories), Mary’s Gone Crackers (80 calories), Olives Basil & Garlic (50 calories), Enlightened Broad Beans Garlic & Onion (100 calories), Lucy’s Gluten Free Chocolate Chip Cookies (100 calories). Total = 414 calories, 20g fat, 51g carbohydrate, 11g protein, 684mg sodium, 7g fiber/89 minutes of walking. Trio of premium cheeses: sharp cheddar, garden vegetable, and Gruyere, dried cherries, crackers. Total = 601 calories, 33g fat, 56g carbohydrate, 21g protein, 1125mg sodium, 4g fiber/130 minutes of walking. Fat-free plain Chobani yogurt served with granola and a side of honey. Total=210 calories, 0g fat, 32g carbohydrate, 17g protein, 125mg sodium, 1g fiber/45 minutes of walking. An assortment from Beecher’s Handmade Cheese: Aged Flagship, creamy Dutch Hollow Dulcet, peppery Marco Polo, and Jamaican Jerk-seasoned No Woman. Served with Beecher’s Original Crackers, honey, and fresh grapes. Total=510 calories, 28g fat, 43g carbohydrate, 19g protein, 810mg sodium, 1g fiber/110 minutes of walking. Grilled chicken, brie, arugula and cranberry mustard on a rustic roll, served with a side of fresh fruit. Total = 680 calories, 29g fat, 77g carbohydrate, 29g protein, 1320mg sodium, 5g fiber/147 minutes of walking. Top sirloin steak, red-wine caramelized onions, white cheddar cheese, spinach and horseradish cream on a rustic roll, served with a side of fresh fruit. Total = 600 calories, 26g fat, 57g carbohydrate, 31g protein, 900mg sodium, 4g fiber/130 minutes of walking. Korean-style grilled chicken and buckwheat soba noodles with sesame-seasoned carrot and cucumber slaw, a hard-boiled egg and spicy chili glaze. Total = 580 calories, 7g fat, 107g carbohydrate, 20g protein, 1890mg sodium, 8g fiber/125 minutes of walking. Cannellini beans, dried blueberries and cranberries, quinoa, and grape tomatoes over chopped kale and spring greens, served with white balsamic vinaigrette. Total = 320 calories, 15g fat, 43g carbohydrate, 5g protein, 90mg sodium, 6g fiber/69 minutes of walking. Comments: United’s individual snacks are up in average calories from 283 to 375.6, but overall calories for everything is only slightly higher. United is the 4th largest airline in the US, they should be thinking about healthy food. Years ago they were a were number one in this area. The breakfast, lunch and dinner menu has many new options; however, healthy meal choices fare limited. It’s too bad United eliminated the oatmeal for breakfast; it was a good choice. The good news, nutritionwise, is that they did put eggs back into the lineup. Best Bets: Among the individual snacks, the humus is the best choice. Or else share the Sweet & Savory Bistro Blend Trail Mix with at least a few others if you can. It’s better than the other choices. Get the Tapas snack box, which is high in calories but has many healthy foods, including almonds, olives, hummus and bruschetta; just toss out the cheese spread. You should also share it unless you’re eating it as a meal. Skip the Classic and Select snack boxes. For breakfast, your best bet is the Chicken Sausage Egg Skillet, but skip the chicken sausage to save calories.. Also, skip the ham baguette. For Lunch/Dinner, the airline removed last year’s best bet, the wrap and salad combo. The new options are not great; however, the Mediterranean Chicken Wrap is your best bet and should keep you full. For kids, the Ben Flyin is better than any of the other airlines’ kids boxes and might be worth getting to keep your kids smiling, but probably will not fill them up. Hormel Hard Salami, Dairyfood White Cheddar Cheese Spread, WOW Baking Snickerdoodle Cookie, Swedish Fish, Fun Size Plain M&Ms, Acacia Cream Crackers, Deep River Kettle Chips. Hormel Genoa Salami, Glacier Ridge Farms Smoked Gouda Gourmet Cheese Cup, Mediterranean Snacks Cracked Pepper Lentil Crackers, Snyder’s of Hanover Gluten Free Pretzel Sticks, Chlostro di Saronno Crunchy Amaretti Cookie, MadiK’s Hickory Smoked Almonds, Marzetti Honey Mustard Sauce. Mario Pitted Snack Olives, Herb & Spice Seasoned, La Panzanella Rosemary Croccantini Cracker, 4-pack, Brookside Dark Chocolate Acai with Blueberry Fruit Flavors, MadiK’s Whole Natural Nonpareil Almonds, Heritage Roasted Red Pepper Bruschetta, Torino Olive Bites, Pick Pocket Dips Traditional Hummus, Rondelé Peppercorn Parmesan Cheese Spread. Grilled chicken, feta, roasted red pepper cream cheese, romaine, cucumber, bell pepper, spinach wrap with a Godiva chocolate. Comments: American now provides complimentary snacks on flights of more than 250 miles – not healthy though. Average calories have gone done other than the snack boxes (398 to 497). Unfortunately, AA decided to remove the Chicken Cobb Salad, which was one of our Best Bets last year, and replaced it with a higher calorie Turkey and Chutney Sandwich. Furthermore, we were unhappy to find out that the airline decided not to publish food menu information on its website, a strange move leading to even less food transparency. The airline continues to lose out on what could be a tremendous financial opportunity taking a note from current food trends — people care about the foods they eat — healthy foods often have larger profit margins and customers will be happier. Best Bets: For individual snacks the hummus and chips are still your best choice. Skip the snack box unless you toss the salami and cheese. The Thai Ginger Chicken Wrap is a good choice, but skip the sesame-ginger dressing. 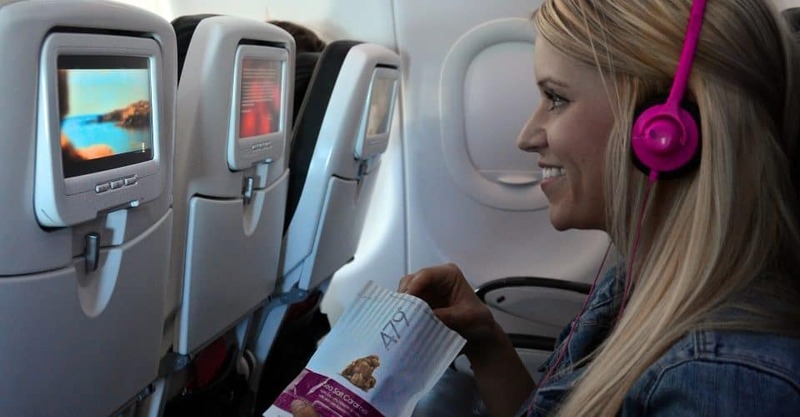 For breakfast on flights of more than two but less than three hours (see below) there’s not much to eat; and while the trail mix may seem like a healthy choice, it’s very high in calories, so you would need to split it with at least one other person. On flights of three hours or more, the Breakfast Sandwich is an OK choice as long as you go light on the honey mustard dressing. The fruit and cheese plate has fresh fruit and the cheese can be OK if you share it with your seatmate. Fresh fruit served with almonds and walnuts, Brie, Cheddar, Muenster cheese and a Ghirardelli Dark Chocolate with Raspberry square. Served with gourmet crackers. Wheat croissant with roasted turkey, Granny Smith apple slices, Havarti cheese and romaine lettuce. Honey mustard dressing is served on the side. Just the sandwich = 546 calories/ 118 minutes of walking without dressing. Whole-wheat tortilla with grilled chicken and Thai broccoli slaw with mesclun greens. Sesame-ginger dressing is served on the side. Wheat bread with apple-cranberry ginger chutney, smoked turkey breast, crisp Granny Smith apple slices and romaine lettuce. Comments: Not much variety and not much in terms of nutritional value. However, they are always helpful – that’s nice. Wish they would add some healthy snacks or at least test a few. This is one of the larger carriers in the US, so it would be great for Southwest to set an example and show that healthy food can sell if it is tasty and curated with consciousness. Comments: At least the airline returns my emails; I just wish they would provide me with the information I need to do the survey. The airline could easily get a nutritionist to do the menu analysis online but apparently chooses not to do it. Even if they just sent the recipes, we could do it for them. But since they didn’t, the calories for all the meals were estimated by Diet Detective nutritionists. Hawaiian is one of the few airlines to serve free food on domestic flights. But watch out—their food is high in calories and the menu doesn’t offer much choice in terms of health, or in the way of food system consciousness (caring about sustainablity, organic growing, no GMOs, etc…). This could be a real disappointment if you are on a long flight and have not planned in advance. Plus, when free food is put down in front of you, you have a tendency to eat it. All of it. That could be a lot of unhealthy food. Best Bets: Among the snacks, choose the Hummus & Pita Chips – it’s really the lower calorie choice, and better than any of the individual snacks, which are very high in calories. You might think the Salted Macadamia Nuts would be a good choice, and they do have healthy properties, but only if you split them with 5 other people or have them over the course of a few weeks. Also, keep in mind, you will probably get a very high calorie, unhealthy free meal on your flight- so go light on those snacks. Don’t be fooled by the Gluten Free Box; while many of the individual items are OK healthwise, it’s still high in calories and should be shared or eaten as a meal. For the complimentary meals try to go light on the breads, treats and dressings. In the end, it would be best to eat before you board the plane; otherwise else you might wind up feeling lethargic and cranky after one of these calorie-heavy meals. The meals and accompaniments look very heavy and unhealthy. Just say no, and bring your own food. Good Bean Roasted Chickpea Snacks (90 calories), Crackers (60 calories), Welch’s Fruit Snacks (80 calories), hummus (67 calories), turkey stick (70 calories)*, cookies (120 calories)*. Comments: The media response was excellent this year and helped to clarify some of last year’s estimates. 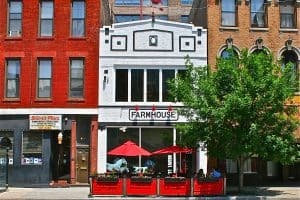 Would still appreciate a few more healthy food items on the menu – I bet they would sell. Best Bets: For the individual snacks, the nuts might work if you share with at least one other person. The hummus snack pack is your best bet if you’re mid-flight, but the snack boxes are not great in terms of health (and not just calorie-wise). Avoid the Deli Snack Pack, and while the Wingz Kids Snack Pack is not healthy, if you’re nagged by a child into purchasing it, at least a $1 of every sale is directly donated to Make-A-Wish. Wheat Thins (230 calories), White Cheddar Cheese Spread (50 calories), Madi K’s Almonds (100 calories), Biscoff Cookies (120 calories), Slim Jim (50 calories). Total = 550 calories/119 minutes of walking. Total = 210 calories/45 minutes of walking. Comments: Paul Berry, the airline’s media spokesperson, doesn’t even respond to emails or calls. Paraphrasing Mr. Berry from previous years: passengers should bring their own food and drinks. But in my opinion, the airline has a responsibility to serve foods that are healthier. As a passenger, you don’t have too many options if you don’t bring your own food. Why not offer 3 or 4 healthy foods? The good news: the calorie count has gone down from last year to 366. The bad news is that there are few healthy options. Best Bet: The cup of noodle soup at 290 calories is still the only choice that will feel like a real meal, but it is very high in sodium, so it is not the best bet for someone who is sodium-sensitive or has high blood pressure . All the muffins are at least 400 calories—not the best choices unless you split one (if you’re the type of person who can do that). Bringing your own food is actually the best option. The chips and salsa are the lowest calorie choice of all the snacks but probably won’t fill you up. Skip the snack box. Comments: Two years ago the PR / Media team behaved shamefully; last year they were radio silent, and this year they were back with their typical nasty, condescending tone. Here is an abbreviated quote from their email: “Without impeding operations I cannot go pillage through a catering carts while a plane is on the ground to take photos of these items, nor as we indicated can we get access to the catering kitchen…. )- feel free to state that for the most recently added items (Chewy Candy – Spree, and the trail mix) the nutritional information was unavailable.” Really, Frontier? Transparency is important, and people do care about the foods they eat. Get some healthy choices and create transparency about your foods. Also, calories and offerings are moving in the wrong direction. Calories are up over last year. Best Bets: Perhaps the trail mix — but we had to estimate the calories and don’t know the nutrient values – share it and you’ll be safe. Also, if you’re not sodium sensitive you can grab the jerky. Bring your own food is the bottomline. – Water: Buy it after the security checkpoint to take onboard. Dehydration can cause or exacerbate hunger, jet lag and fatigue. – Cereal: Shredded Wheat or other low-calorie cereals. Look for portable choices at under 120 calories per cup. You can also look for cereal in a cup. It’s portion controlled in 1.5-ounce packs that are easy to store and easy to use. – Fruit and salads: Stick with fruits such as apples and oranges that can withstand some rough treatment. You can even bring a banana if you put it in a container such as a banana saver (www.bananasaver.com). Grapes or almost any other fruit can be carried in a plastic container. Also, fruit and salads are often sold in the airport. They’re a bit more expensive than bringing your own, but at least they’re healthy alternatives to what is served onboard.